For light duty hinges in the UK, contact Ironmongery Experts today; we’re proud to provide only the very best construction and joinery components on the market, and our selection of specialised hinges for residential, commercial and industrial use are available in a variety of designs and metal finishes, making it easier to find the exact one you need. 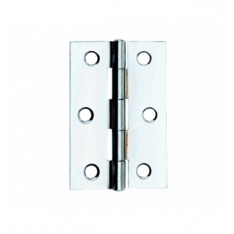 A light duty hinge is best suited for lighter doors where only a small amount of tensile strength is required. This makes them ideal in smaller frames where a compact hinge is most ideal. If you need something a little more generalised, our selection of ball race hinges are suitable for a massive variety of applications in many sectors. For more heavy-duty uses, our phosphor bronze washered hinges provide an extra boost in durability, and our range of heavy reversible hinges make installing cast iron gates and similar set ups simple. Similarly, our broad butts are perfect for frames and doors of a large and heavy nature, so they won’t let you down on strength. For more domestic scenarios, we have a wide assortment of piano hinges for smooth piano cover operation, cabinet hinges for the functional modern kitchen, and even more theft-proof arrangements using our premium spring hinges. We also provide for more particular set ups in and around the home, with our hook & band hinges offering increased resistance against rust through galvanisation. The weight-distributing qualities of our tee hinges and the low-friction operation of our assorted thrust bearing hinges also make them ideal for situations in which a large number of people use the door every day. Finally, we even cater for doors with customisations to allow the bypassing of an obstacle, such as pipework or a beam. Our parliament hinges are well-suited for these calibrations since they’re available in a wide variety of designs and metal finishes, much like the rest of our hinges.